Check out the horn-rims on those guys. The year was 1975, the place, the First United Methodist Church of Emmett, Idaho. I was in the eighth grade. 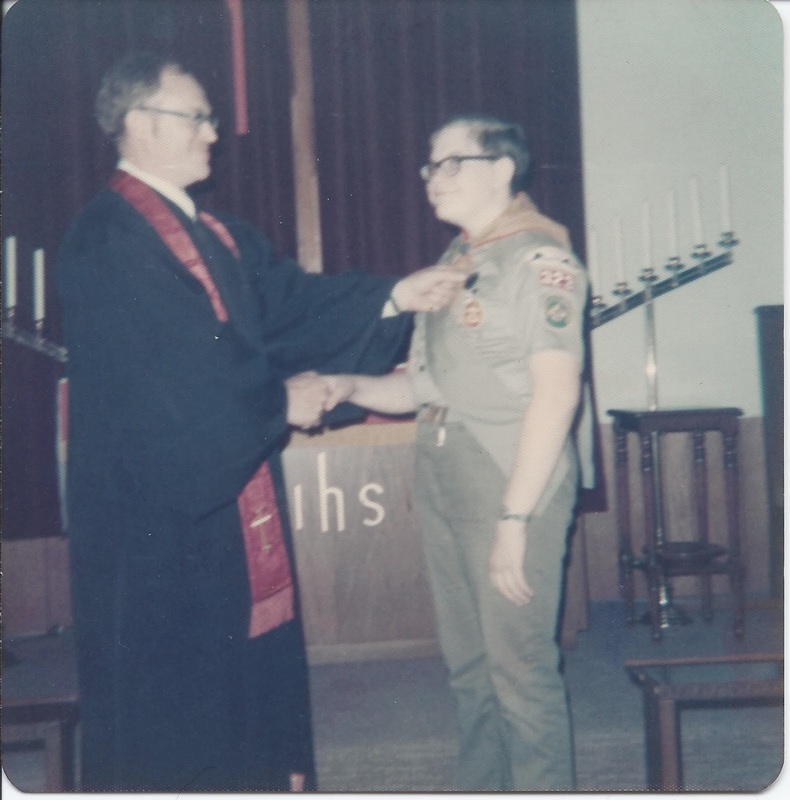 My father, who was also my pastor, was proudly pinning my God and Country badge on my Scout uniform. He was 48; I was 14. I had just discovered girls, though it would be another nine years before I finally went on a date with one. The boundaries of my world were the walls of a decrepit middle school, a brand-new public library, a tiny manufactured home that was the parsonage, and this church. The parsonage was eventually sold (presumably so the pastor could live in something with room for a family), the school relocated when a new high school made the old high school building available, and the church was eventually torn down, with the congregation buying to a former Church of Christ as they, too, moved to a larger facility. Only the library is as I remember it--though now it is doubtless showing the wear and tear of its forty years. Last summer I drove through Emmett, showing the town to Amy, and was amazed at both the familiarity and foreignness of the place to me. I'm sure a large part of that strangeness came from changes in me. Apart from when I put on my Scout uniform and took on a leadership role, my identity was primarily that of a victim. We arrived in Emmett in 1972 and remained there for three years. From almost the first day of sixth grade, I was bullied as I had never been before. In fact, I was coming off my best year of school: fifth grade had been magical for me, a year that gave me confidence as a student and a young person, with some solid friendships. Had we stayed in Filer, I would probably have built on that. Instead, I found myself in a school that singled me out as a foreigner, a Gentile in a land of Mormons, a chubby bookish kid with thick glasses whose pacifist father could be counted on to mete out, at worst, a stern rebuke to anyone who followed his son home from school spitting on him all the way--assuming the perpetrator could ever be identified. Many times, my tormentors were boys whose names I simply didn't know, and they were smart enough to vanish before a teacher or parent could catch sight of what they were doing to me. It's no wonder, then, that I came out of Emmett feeling every bit a victim. High school in Oregon was liberating in many ways, but I never managed to make close friends there, even though there were a number of peers I hung out with at lunch and in class who, I'm sure, would have been happy to spend time with me outside of school hours. Somehow, I just couldn't make the leap; and I have to admit to feeling some envy for the solid friendships I witness Amy's and my kids having. And, of course, the glasses inhibited me from the one pursuit which, above all others, was to make a new man of me: running. But I'll get back to that in a paragraph or two. I finally ditched glasses altogether about five months after this photo was taken, switching to my first set of contact lenses. I remember gaping at everything I could see with those tiny bits of plastic floating over my corneas, most of them things I could see quite well through my glasses--but not if I looked up! When I rolled my eyes up to the top of a tree without moving my head, I could still see every leaf. Contacts never fogged up, never obstructed my view with fingerprints or dust, and (once I finally had a pair that fit) were at no risk of falling off when I exercised. Best of all, they left my face unobstructed. For the first time in my life, I did not have to look like a nerd. I saw many things through my contact lenses: mountains, valleys, stars, cathedrals, skyscrapers, sunsets, forests and, eventually, women with whom I fell in love. But there were limits to what I could see: contacts wore out, had to be replaced, and were so expensive that, without vision insurance, I usually hung onto them longer than I should, even as protein deposits and small nicks and tears in them made them uncomfortable. I had to take them out every night for cleaning and disinfection. If I was going to be up late, I would have to, at some point, switch to glasses. 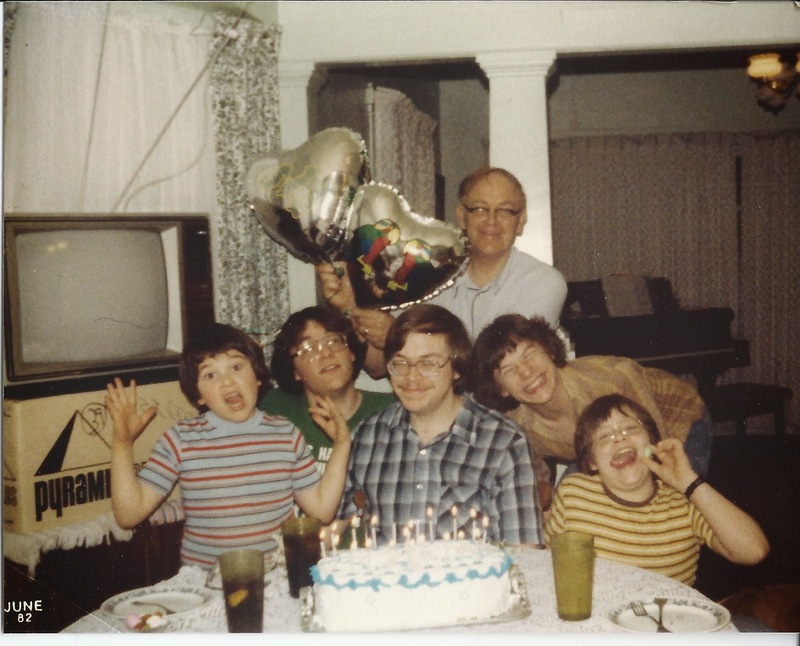 I'm fairly sure I saw both my children for the first time through the glasses I'm wearing in that birthday picture, since both were delivered after all-night labors. There was also the risk of having a lens come out when I wasn't home and not having a backup plan. Even once the price came down and I was able to change lenses monthly instead of annually, they were a hassle. But running--oh, how wonderful running was with contacts! I would not have run seven marathons in glasses--or ever run at all, to be honest. Backpacking, too, would have been most unpleasant in glasses. A few weeks ago, I hiked in Forest Park wearing my glasses, as I was prepping my eyes for laser surgery. It was tolerable, but after 31 years in contacts, I was painfully aware of how much I was missing whenever my eyes looked up but the lenses stayed put. Ten days ago, I went through with something I had been contemplating for decades, and had my corneas sculpted by lasers to refocus images directly on my retinas, instead of somewhere in front of them. It is the best $3500 I have ever spent, or probably ever will spend. Today I went out for my longest run since the surgery, 54 minutes. I'm not sure of the mileage--as I near my 53rd birthday, I'm running more for time than distance--but I can say I got more bang for my effort than I've had in months, possibly years. Seeing suburbia with my own eyes, rather than mediated through lenses, made it all seem new, fresh, more real. As I returned home, the sun was setting behind me, the shadows lengthening, the clouds coloring. There was nothing spectacular on this run--nothing that can even begin to compare to the wonders I've beheld through contact lenses--but somehow seeing it without contacts made tract homes seem like stately manors, powerlines like monoliths, Springville Road like the Appian Way. It was all new, fresh, startlingly present to me. I begin each day now in awe that (once the light is on, of course!) I can see the bathroom counter, see myself in the mirror, see the shower head without first putting in contacts. I prepare my breakfast seeing the coffee grinder, the toaster oven, the dishwasher, the refrigerator, all with my own eyes. Just before I leave for work, I head upstairs to brush my teeth and, most wonderfully of all, to see Amy, fast asleep, by the light coming from the hallway, with my own eyes. I kiss her gently, ease the door shut, and set out for a day of visual adventures. I have no illusions about my nerdiness--I can quote Star Trek episodes--but I feel wonderfully empowered by the removal of those lenses, and the gift of seeing everything, for the first time, with my own eyes. Great entry Bro, glad you are at last "seeing" some relief from the bullying of the past. I remember those days in Emmett too, so bad that when we moved to Oregon, it was like leaving hell to the Promised Land.